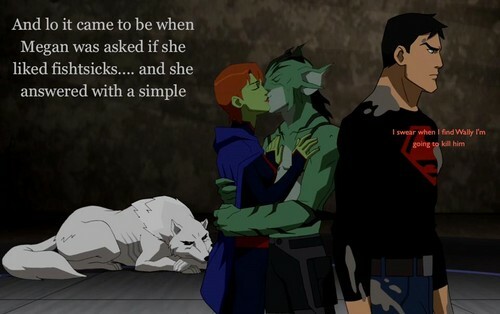 What happened to Superboy Megan and Wally. Contrived spoiler. HD Wallpaper and background images in the Young Justice club tagged: justice young wally superboy kid flash， megan. I know, just my two cents on what could have happened, Wally asked Megan about fishsticks she took it too seriously and now Wally's in hiding in fear of Superboy. Where'd Artemis go, too? If she was mentioned I missed it. I miss wally and artimis. I hope there okay.